1.There are 1600Pcs(+/-2%) heat shrink tube in the package, 800Pcs of them are yellow,2mm Dia,35mm length. 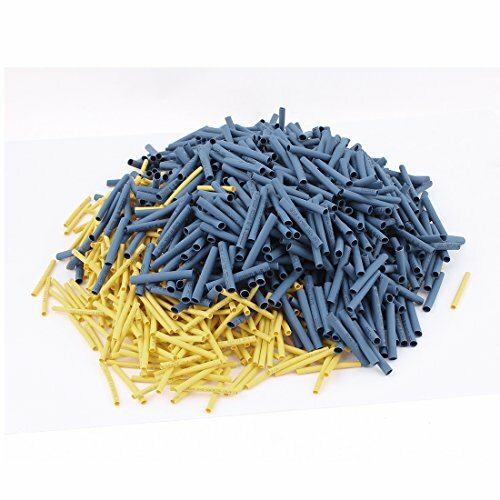 800Pcs of them are blue, 3.5mm Dia,35mm length. 2.Polyolefin Heat Shrink Shrinkable Wire Insulation Tube Sleeving, Ratio 2:1. 3.Mainly used in wire, solder joint protection, electrical wire end and electronic devices protection and insulation protection, on the surface of parts and metal protection, anti-rust, anti-corrosion treatment related products, wire and other products identification,etc.